Happy New Year! We have plenty of award-winning teas coming in our January boxes to help you ring in the New Year. If you'd like to completely switch from one box to another, please fill out this form by January 1. If you have any questions about your subscription, simply contact us here. We will take substitution requests for allergy concerns or even preference. Just contact us with your request. and may not receive the exactly the same teas as listed below. Visit tearunners.com/amazon for more info. Nothing starts a day off on a brighter foot like a hearty and strong cup of English Breakfast. This English Breakfast, from the most awarded tea company in the world, is a blend of high grade assam, ceylon, and keemun black teas. It brews a strong and flavorful cup with notes of decadent caramel. This tea is smooth enough to stand beautifully on its own, or add a touch of milk and sugar for an old-school and delicious tradition. A perfectly revitalizing and vibrant tea to brighten up a sluggish day, this high quality Yunnan black tea is infused with a refreshing dose of mint and tangy citrus. Waken up the palate with lemon verbena and peppery calendula, soothing the throat and settling digestion while packing a caffeine punch ideal for tackling your to-do list. Ingredients: Yunnan black tea, mint, calendula, lemon verbena, and natural flavoring. After a short summer season, the Himalayan monsoon soaks the fertile soils of Sandakphu in eastern Nepal producing a rare artisan tea that reflects all of nature’s goodness. This truly outstanding tea, with its lovely balance of stone fruit and honey, was awarded 1st Place in the highly competitive Black Tea category of the Tea Championship Awards. From an area of abundant rainfall and fertile soil in western Kenya, this black tea is a complex, robust, and authentic caffeinated kick. We love an old fashioned deep and full-bodied CTC that makes no apologies for its strength and earthiness. As a Tea Runners member, you'll be pleased to know that all profits from the sale of this tea go to the schooling fees for orphans in western Kenya. This juicy and full-bodied herbal blend is like biting into a roasted and caramelized plum. A touch of spice is added with cinnamon and licorice root, pleasantly enhanced with the scent of sweet hibiscus flower. Cinnamon Plum is a warming blend of juicy plum, succulent currant and sweet Saigon cinnamon. Ingredients: Cinnamon, hibiscus flowers, currants, licorice root, natural plum flavor. Hundreds of years ago, tea masters in Southeast Asia blended fermented pu-erh tea with citrus and spices to create a nourishing and invigorating tonic. This modern day blend pays tribute to this traditional tea recipe. The citrusy ginger with zesty orange peel and a hint of lemongrass provide a nice balance to this robust, slightly earthy and full-bodied pu-erh tea. Pu-erh Ginger brews an energizing cup that warms the whole body. Ingredients: Pu-erh tea, ginger root, orange peel, lemongrass, lemon verbena. Warm your tummy and heart with this extra spicy chai, a tea that enlivens and wakes up the sense without the addition of caffeine. We love the traditional combination of ginger, cardamom, and clove with the punch of black pepper that sings on the tongue, all with a subtle sweet finish that invigorates the entire palate. Ingredients: Black pepper, cardamom, cinnamon, clove, and ginger. Similar to rooibos, but slightly sweeter and more hearty, honeybush brews a deliciously comforting cup of tea. Honeybush tea is prepared from the honey-scented Cyclopia plant found in the Cape Mountain regions of South Africa. Its unmistakable notes of hot apricot jam and a refreshing floral sweetness grant this tea a forever favorite in our herbal collection. Try it the traditional way with milk and sugar, or enjoy it in its pure state to truly appreciate its true wonderful flavors. Jade Oolong is a highly-prized tea grown at elevations of 500-850 meters above sea level in the Mingjian Village of Nantou, Taiwan. It is made from large, tightly rolled leafs that expand tremendously when infused. 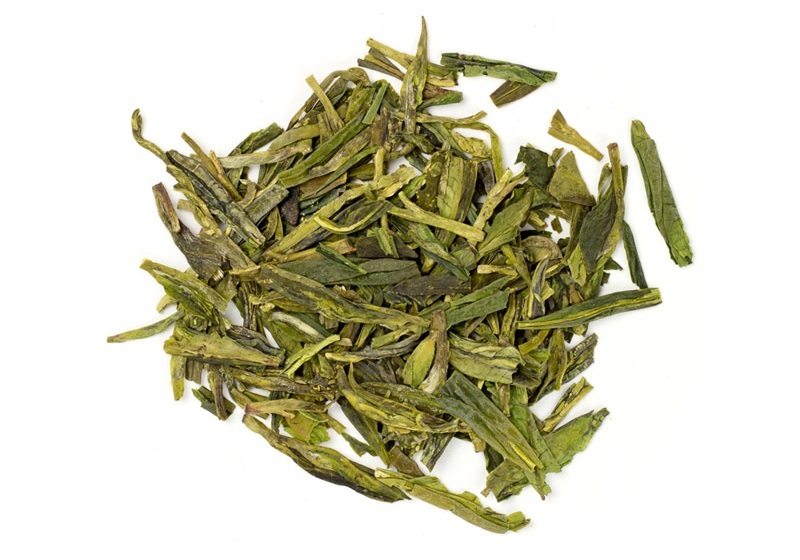 Jade Oolong steeps a lovely golden-green, medium bodied infusion and has a fresh floral aroma with notes of tropical fruit. This tea is a perfect afternoon sipper. Once enjoyed by emperors of the Qing Dynasty, this "national drink" of China is a fired green tea with a crisp and fresh mouthfeel. Its finish holds lingering notes of roasted chestnut and green peas with a natural nutty sweetness. A beautiful tea to end a meal or to perk up a lull in the afternoon. This Anhui Keemun black, known as the "Burgundy" of black teas, is rich and brisk, steeping to a vibrant red liquor and awakening the body at first sip. We love its lively and bright personality, beautifully enhanced with hints of cocoa and full boded sweet bouquet. Enjoy this one over multiple steeps to kick off your morning right. A perfect after dinner treat, this unique beauty is a smooth, lemony brew with a hint of spice. Tumeric, ginger, and fennel help the body's digestion while tart lemongrass rounds everything out to a pungent and delicious finish. If you have any allergy concerns about the teas coming this month, please contact us for help.